Mike Adams At His Honest Weight rounds out 2015 with Preparation Age, a new 5-song one-sided LP. The Bloomington, IN based band has two full-lengths to their credit and operate in an experimental pop framework that touches on Wheat’s Hope and Adams, Grandaddy’s The Sophtware Slump, and Soft Bulletin-era Flaming Lips with Beach Boys harmony sensibilities. Their previous album, Best of the Boiler Room Classics, was released in 2014 on Flannelgraph Records and Joyful Noise of which Pitchfork said “Part crooner and part pop star, Adams projects an outsize persona from the stage, which he then punctures with his between-song banter. Somehow he manages to come across as both ironic and deeply sincere, goofing on the conventions of pop music even as he embraces them as a means of communicating some deep pain.” These five songs were recorded during the same sessions as a forthcoming 2016 full-length and serve as companion songs and a taste of what is to come. They build on the solidly crafted pop songs of Boiler Room Classics through sonic experimentation and take the Mike Adams At His Honest Weight sound into a hazier new territory. The drums tracks were recorded at Sleepwalk Recording in Bloomington, IN on 1/2″ tape at 1.5x speed and manually slowed down. The tape adds depth and warmth and the speed adjustments give the drums a strange, dreamy quality, especially to the cymbal sustains. That baseline support colors Preparation Age and the future full-length. “Lehrpez” is stripped down and opens the EP with a revamped take on ‘50s doo-wop finger snaps and plunking bass melody filtered through a Beach Boys harmonic sensibility. “Too Mas” incorporates some social media crowd-sourced backing vocals. Adams made a request through Facebook and Twitter looking for volunteers to contribute backing vocals. 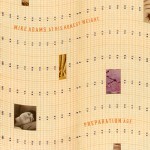 Adams then took the submitted tracks, including one from his own parents, and merge them all, unaltered, as the somewhat eerie call-and-response refrain. “Live Alone” builds from some shimmering synth lines and breathy harmonies to a schmaltzy ‘70s variety show horn section and guitar solos. “Weather On” is a bit of a down tempo personal reflection of the past and friends who have drifted away supported by piano melodies and string and synth swells. “Unforgettable People” is a reference to a Charles Kuralt special of the same name featuring a rich tapestry of portraits of regular, everyday people who are all doing strange and extraordinary things. But, in true Mike Adams fashion, the lyrics raise an eyebrow to some Kuralt skeletons in the closet by way of a secret second family revealed two years after Kuralt’s premature death in 1997. 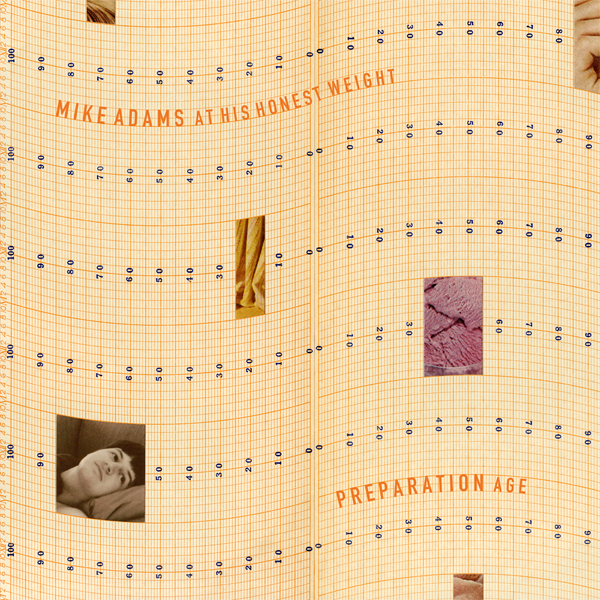 Throughout Preparation Age, Mike Adams manages to tell stories of forgotten friends and everyday people, turning fear and anxiety from the departed past into something pleasing and beautiful. Preparation Age is presented in a limited pressing of 500 copies with the B-side featuring a pinball machine influenced design by Bloomington artist and musician Chad Serhal. The jacket was designed by Bloomington collage/print artist Janelle Beasley. While not being released digitally, the one-sided LP does include a digital download for listening convenience. Late 2015 and early 2016 will find Mike Adams At His Honest Weight and live band members Aaron Denton, David J. Woodruff, Zac Canale, Kurt Friedrich, and Ben Lumsdaine hitting the road in support of this one-sided LP and the emerging full-length yet to come. The band will find their way to the West Coast for the first time for 14 dates in October with Sound of Ceres. In the more perfect universe next door, 2016 is the year for Mike and the boys’ magnum opus crowning achievement that will earn them a well-deserved gold record. For 2015, in the here and now, it’s Mike Adams At His Honest Weight‘s Preparation Age.